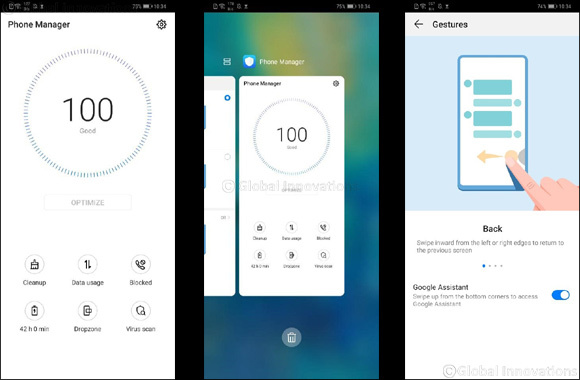 Riyadh, Saudi Arabia – November 19, 2018: The new Huawei custom operating system comes with the all-new gesture navigation mode. So how does this improve upon the already stellar FullView user experience? In times of travel and transportation, everyone knows the value of a smartphone in helping to have a good time. A thumb’s usually good enough for normal browsing, but at times you’ll want to switch things up and use other apps—then it dawns on you: you’re having a hard time reaching the navigation bar with that finger, while holding on to their other hand with a cup of coffee that's hard to control. But in the all-new gesture navigation mode, you can easily swipe from the edges of the screen towards the center to get around the device, allowing you to assume full control of the device with a single hand. While it’s true that you’ve always been able to stow the navigation bar, but that’s never ideal because it was the thing you need to control your device. Hiding it only adds complexity. The new navigation mode replaces the buttons with simple gestures. Not only is this more ergonomic, a big change it brings is it takes away the bar entirely! Good riddance we say – the fewer competitors fighting for screen real estate, the better. The EMUI 9.0 is the best UI yet. With a performance that is 12.9 percent faster than its predecessor and the ability to launch apps at a quicker rate, EMUI 9.0 delivers unparalleled capabilities and makes Huawei one of the first handset makers to launch a custom operating system based on Android Pie. As well as the GPU Turbo 2.0 in EMUI 9.0—it’s the second generation of Huawei’s innovative graphics processing acceleration technology that is based on the foundations laid by GPU Turbo. GPU Turbo 2.0 can enhance touch controls in games and works in concert with the App Assistant feature to deliver a smooth, premium mobile gaming experience. These features all allow for a more efficient user experience while operating the phone. The new gesture navigation mode is available via EMUI 9.0 on the new Huawei devices like HUAWEI Mate20 Series. Huawei had launched the anticipated flagship smartphone HUAWEI Mate20 Series in Saudi market and most highly anticipated smartphone series of the year. Representing a momentous milestone in the history of the HUAWEI Mate Series, the HUAWEI Mate20 Series embodies the pinnacle of innovation. Designed with the industry’s most powerful and sophisticated process technology, the latest Huawei flagship devices set a new bar by which all 2018 smartphones will be measured. The HUAWEI Mate20 Series is powered by Huawei’s densest and highest performing system on chip (SoC) to date—the Kirin 980. Many new and unprecedented technologies are included in the new phones. The HUAWEI Mate20 Pro features reverse charging that will be capable to transforming the phone into a wireless charging unit to charge other phones. HUAWEI Mate20 Pro is equipped with a 40MP main camera, a 20MP ultra wide-angle camera, and an 8MP telephoto camera. Together, the trio of lenses supports a wide range of focal lengths enabling it to mimic the results from professional cameras. This wider perspective creates a sense of spaciousness and a three-dimensional effect to the images. The new camera system also supports macro distance, which produces crisp images of objects that are laces as closed as 2.5 cm from the lens as well as the 24-megapixel front camera and the portrait feature in video recording with the support of advanced artificial intelligence techniques. Besides superb performance, the HUAWEI Mate20 Series also features groundbreaking improvement on battery life. It houses a large, high-density 4200mAh battery for HUAWEI Mate20 Pro and 4000mAh battery for HUAWEI Mate20, and supports 40W HUAWEI SuperCharge. The safety of the technology is certified by TÜV Rheinland.